Draft: 1995, New York Mets, 8th rd. Allan James Burnett...Wife's name is Karen...Has two sons; Allan Jr. (13) and Ashton (10)...Is a 1995 graduate of Central Arkansas High School, where his jersey #34 was officially retired on 12/6/02...Joined forces with the Adam Walsh Children's Fund and the National Center for Missing and Exploited Children to "Play it Safe," hosting awareness days while playing in Miami in 2001 and 2002...Also served as the national spokesman for the National Center for Missing and Exploited Children...His cap and a baseball from his 5/12/01 no-hitter at San Diego are on display at the National Baseball Hall of Fame and Museum in Cooperstown, NY. Signed with Philadelphia as a free agent on 2/16... Shared the National League lead in starts while spending entire season with the Phillies...Tied career high in starts and pitched over 200 innings for the sixth time...Ranked seventh among N.L. pitchers in innings pitched and ninth in strikeouts...Led the circuit in walks, losses and runs allowed...Went 2-1 with a 2.06 ERA (43.2ip/10er) in his first seven starts thru 5/3...Won his 150th career game on 5/20 at Miami...Pitched his 24th career complete game on 6/20 at St. Louis...Tossed 8.0 scoreless innings, but received a no-decision in Philadelphia's 3-1 loss to Madison Bumgarner and the Giants on 7/23...Struck out a season-high 12 batters on 8/25 vs. Washington - his third game of the season with 10 or more strikeouts and the 35th of his career...Pitched most of the season with an inguinal hernia, which was surgically repaired on 10/3... Signed with Pittsburgh as a free agent on 11/14. 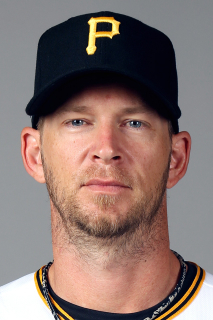 : Won at least 10 games for the eighth straight season and for the 10th time in his career...Led Pirates in strikeouts and innings pitched...Tied for sixth in the National League in wins, his second-highest total behind an 18-10 mark with Toronto in 2008...His 180 strikeouts were the most by a Pittsburgh righthander since Kris Benson whiffed 184 in 2000...Went 14-3 with a 3.19 ERA (132.2ip/47er) in his first 20 starts thru 8/5 (Pirates went 17-3) and 2-7 with a 4.13 ERA (69.2ip/32er) in his last 11 (Pirates went 2-9)...Was acquired from New York (AL) on 2/19 in exchange for minor league pitcher Diego Moreno and minor league outfielder Exicardo Cayones...Suffered a fractured right orbital bone during a bunting drill on 2/29...Had surgery on 3/2 in Pittsburgh (surgery performed by Dr. Randall Beatty) and returned to Bradenton on 3/9 to start his rehab program...Began regular season on the 15-day disabled list...Made first rehab start with Bradenton on 4/6 and threw 68 pitches (4.2ip/2h/1r/1er/1bb/5so) vs. St. Lucie Mets....Made two more rehab starts, throwing 41 pitches on 4/11 in a loss with Bradenton at Palm Beach and 81 pitches with Triple-A Indianapolis on 4/16 vs. Toledo...Was reinstated from D.L. and made first start with Pittsburgh on 4/21 vs. St. Louis; tossed 7.0 scoreless innings and struck out seven batters while winning a 2-0 decision...Suffered 6-1 loss in second start on 4/27 at Atlanta...Gave up 12 runs in 2.2ip while suffering loss at St. Louis on 5/3; became first Pittsburgh pitcher since Glenn Spencer on 4/24/32 at Chicago (8.0ip/12r) to give up 12 runs in a game and the first Major League starting pitcher since 1913 (when earned runs were first officially recorded throughout the Majors) to permit 12 or more earned runs in an outing of fewer than three innings...Rebounded and struck out 10 batters in 8.0ip, but received a no-decision in next start on 5/8 vs. Washington...Singled off Johnny Cueto on 5/20, snapping an 0-for-16 streak at the plate since 6/20/09...Won eight straight starts from 5/19-6/28 - just the second Pittsburgh pitcher since divisional play began in 1969 to register a win in at least seven consecutive starts in a single season since Dock Ellis had two such streaks: eight straight in 1974 and 10 straight in 1971...Went 5-0 with a 2.84 ERA in five starts during the month of June...His RBI on 7/8 vs. San Francisco was his first since 8/9/05...Won nine straight decisions from 5/19 thru 7/8 - the longest streak by a Pittsburgh pitcher since Dock Ellis won 13 in a row in 1971...Won his 11th game on 7/21...Came within four outs of throwing a no-hitter on 7/31 at Chicago; surrendered a two-out single to Adrian Cardenas in the 8th inning while tossing his 10th career shutout and 22nd career complete game...Was named N.L. Player-of-the-Week after going 2-0 with a 1.02 ERA (17.2ip/2er) in week ending 8/5...Won his first seven home decisions before losing to San Diego on 8/11; the last Pittsburgh pitcher to win his first seven home games was Freddie Green from August 1959 to September 1960...Went 1-6 with a 3.45 ERA in his last nine starts, losing a season-high four straight decisions from 8/27 to 9/18...Struck out a season-high 11 batters in 8.0ip while winning his last game on 9/23 at Houston...Suffered a 1-0 loss (8.0ip/1er) to Homer Bailey, who threw a no-hitter, on 9/28 at PNC Park...Gave up four runs in 5.2 innings while suffering loss in final team game on 10/3 vs. Atlanta...Went 8-6 with a 3.10 ERA in 17 starts at PNC Park; went 7-0 with a 2.00 ERA in his first 10 starts on home turf...Went 4-for-63 (.063) with three walks, two RBI and five sacrifice bunts at the plate...Was named the Pirates Most Outstanding Pitcher by the Pittsburgh chapter of the Baseball Writers of America. Spent his third and final season with the Yankees...Won at least 10 games for the seventh straight season and for the ninth timein his career...Set career highs in home runs allowed and wild pitches while tying career high in earned runs allowed...Led the Majors in wild pitches;his 25 wild pitches marked the most in a single season since the start of the 2000's and was the fifth-highest total since 1900...Went 8-7 with a 4.15ERA (119.1ip/55er) in 19 starts prior to the All-Star break and 3-4 with a 6.88 ERA (70.2ip/54er) after the break...Won each of his first three starts forthe first time in his career and started a season with a 3-0 record for the third consecutive year...His loss on 4/25 vs. Chicago (AL) snapped a stretchof 14 undefeated April starts as a member of the Yankees (2009-11); he went 8-0 with a 4.00 ERA (87.2ip/39er) over the span...Appeared as a pinchrunner at first base for Chris Dickerson in the 15th inning of the Yankees' 4-1 win at Baltimore on 5/18 - marked the first time a New York pitcherserved as a pinch runner since Jaret Wright ran for Jason Giambi in the 9th inning on 7/22/06 in a 5-4 win at Toronto...Did not record a fly ball out in hisstart on 6/18 at Chicago (NL), accomplishing the feat for the first time in six years; last did it while with the Marlins in 2005...Struck out four battersin the 6th inning on 6/24 vs. Colorado, becoming the first Yankees pitcher in franchise history to do so; he accomplished the feat for the second time inhis career (also in the 1st inning on 7/5/02 with Florida vs. New York Mets)...Became just the second pitcher in MLB history to accomplish the feat onmore than one occasion, joining Chuck Finley, who did it three times (4/16/00 vs. Texas, 8/15/99 at Detroit and 5/12/99 at the Yankees)...Gave up fivehits in his start on 7/29 vs. Baltimore, all extra-base hits; became just the second Yankees pitcher in the live ball era (since 1920) to toss at least 8.0innings and allow at least five hits - all of which went for extra-bases: also Catfish Hunter on 6/24/77 vs. Boston (8.2ip/5h - two doubles and threehomers)...His victory on 8/15 at Kansas City was his first in the month of August since 2008, snapping a 14-start winless stretch (since 8/29/08 withToronto)...Made lone relief appearance (fifth career) in his last outing on 9/28 at Tampa Bay, retiring the only batter he faced...Started and won GameFour of the American League Division Series at Detroit on 10/4 (5.2ip/1er). Was 10-15 with a 5.26 ERA (186 2/3 IP, 109ER) in 33 starts with the Yankees ... set career highs in losses, runs allowed (118), earned runs, ERA and hit batsmen (19), and tied a career high with 25 home runs allowed ... set the franchise mark for highest single-season ERA among pitchers with at least 30 starts or 180 IP ... opponents batted .285 (204-for-785, 25 home runs); LH .286 (110-for-385, 11 home runs) and RH .285 (94-for-330, 14 home runs) ... the Yankees were 13-20 in his starts. Became one of four Yankees to lose 15-or-more games in a single season in the last 34 years (since 1977), joining Tim Leary (9-19 in 1990), Melido Perez (13-16 in 1992) and Andy Hawkins (15-15 in 1989) ... became the first pitcher in franchise history to lose 15 or more games with an ERA above 5.00 and just the fifth player in Baseball history to post such numbers for a team that made the postseason, joining Tampa Bay's James Shields (13-15, 5.18 ERA in 2010), St. Louis' Jason Marquis (14-16, 6.02 in 2006), Minnesota's Carlos Silva (11-15, 5.94 in 2006) and Baltimore's Dennis Martinez (7-16, 5.53 in 1983), according to the Elias Sports Bureau. Held opponents scoreless six times, tying for the fourth-most such games in the American League ... also held opponents without an earned run seven times this season, tying for the sixth-most such starts in the AL in 2010. Allowed six-or-more runs in a game a Major League-leading 10 times (going 0-10 with a 13.70 ERA in those starts) ... marked the most such games by a Yankee since David Cone had 12 in 2000. Surrendered the first run of the game in 21 of his 33 starts ... allowed opponents to bat .345 (48-for-139) with 27 runs scored in the first inning ... opponents had a .272 BA (156-for- 576) and scored 91 runs from the second inning on. Threw 16 wild pitches, tied for third in the Majors and second in the AL ... owns two of the four highest single-season wild pitch totals in Yankees franchise history (also Tim Leary-23 in 1990; Burnett-17 in 2009; and Jason Grimsley-16 in 2000). Led the Major Leagues with 19 hit-by-pitches, setting a single-season career high (previous high was 12 in 2007 w/ Toronto) ... according to baseball-reference.com, marked the Yankees' second-highest single-season total since the franchise was established in New York in 1903 behind Jack Warhop's 26 in 1909. Allowed a Major League-leading 37 stolen bases ... was the highest total allowed by a Yankee since at least 1950, according to baseball-reference.com. Started the season 4-0 with a 1.99 ERA over his first six starts, marking the first time he won his first four decisions of a season ... his 1.99 ERA was his lowest mark after six starts since 2001, when he posted a 1.71 ERA through his first six starts. Did not allow an earned run in his first 18.1 innings at Yankee Stadium ... streak was snapped on 5/14 vs. Minnesota in his third start at home, when he surrendered a fifth-inning solo home run to Joe Mauer. Compiled a 21.0-inning stretch without allowing an earned run between 4/23 at Los Angeles-AL and 5/9 at Boston ... was his longest such stretch without an earned run surrendered since a 21 1/3 IP streak over three starts from 7/24-8/4/05. Made his 250th career start on 5/4 vs. Baltimore, recording the win in a 4-1 Yankees victory ... his strikeout of Luke Scott in the fourth inning marked his 1,500th K ... came in his 1,621st career IP ... among active pitchers at the time, only Kerry Wood (1,303 IP) and Johan Santana (1,447 IP) reached 1,500 strikeouts in fewer IP. Earned the win on 5/25 at Minnesota in a 1-0 Yankees victory, tossing 5.0 scoreless innings (3H, 2BB, 5K) ... game was suspended tied 0-0 prior to the sixth (rain) and resumed the next day ... got the win after the Yankees scored in the top of the sixth, despite not pitching the day the game was completed. Tossed a season-high-tying 8 IP in 5/30 win vs. Cleveland (5H, 3R, 1ER, 0BB, 8K, 2HP) ... was the fourth time in his career tossing at least 8.0 innings without allowing a walk (first since 6/27/06 w/ Toronto vs. Washington). Rebounded in July to go 3-1 with a 2.00 ERA (27 IP, 6ER) in five starts during the month ... earned the win on 7/7 at Oakland (7 IP, 2ER), snapping a six-start winless streak. Exited his start on 7/17 vs. Tampa Bay after 2 IP with lacerations on his right hand (4H, 4ER, 0BB, 1K, 1WP, 2HP, 1 home runs). Won just once over his final 12 starts (beginning 8/2), going 1-7 with a 6.61 ERA (65 1/3 IP, 48ER) in August, September and October. Posted an 0-4 record with a 7.80 ERA (30 IP, 26ER) in five August starts ... according to Elias, is winless in his last 13 August starts dating to 8/24/08, going 0-9 with a 6.45 ERA (82 1/3 IP, 59ER). Recorded his 20th career complete game on 8/15 at Kansas City (8 IP, 4H, 1ER, 3BB, 6K, 1HP) in a 1-0 Royals victory ... was his fourth straight loss when throwing a complete game. Went winless over his final six starts from 9/6, going 0-3 with a 5.83 ERA (29 1/3 IP, 19ER) over the stretch. Made one postseason start (ALCS Game 4 vs. Texas), suffering the loss (6 IP, 6H, 5ER, 3BB, 4K, 1 home runs, 1WP, 1HP). Was 13-9 with a 4.04 ERA in 33 starts with the Yankees... his 13 wins and 33 starts wereboth the second-highest totals of his career (went 18-10 in 34 starts in 2008)... rankedeighth in the American League with 195K... was second in the Majors with 97BB(Arizona's Doug Davis-103BB)... opponents batted .247 (193-for-781, 25HR); LH .217(91-for-419, 11HR); RH .282 (102- for-362, 14HR)... marked the third-lowest averageagainst left-handed hitters among AL righties and fifth-best in the Majors (min:200BF)... the Yankees were 21-12 in his starts...Tied Felix Hernandez for the Major League lead with 17 wild pitches... marked apersonal single-season career high and was the second-highest total in franchisehistory behind Tim Leary's 23WP in 1990... matched his single-game career-high with3WP in four games in 2009 (4/19 vs. Cleveland, 5/17 vs. Minnesota, 7/8 at Minnesotaand 8/12 vs. Toronto)...Over his final 24 starts (5/27-10/4), was 11-7 with a 3.56 ERA (149.0IP, 59ER) and a .242batting average against (137-for-567), limiting his opponents to 3ER or less in all butfour outings... was 5-2 with a 2.96 ERA (73.0IP, 24ER) in his last 11 starts at YankeeStadium from 6/2-9/29... prior to the stretch, was 0-1 with a 4.78 ERA (32.0IP, 17ER)in five home starts to begin the season...Made his Yankees debut on 4/9 at Baltimore, recording the win in an 11-2 Yankeesvictory (5.1IP, 7H, 2ER, 1BB, 6K, 1HR)... was the Yankees' first win of the season...In his second start on 4/14 at Tampa Bay, retired 18 of his first 19 batters faced,surrendering a second-inning walk to DH Pat Burrell and carrying a no-hitter through 6.0 IP... no-hitbid was broken up byCarl Crawford's singleto left field to start theseventh...Went winless overseven starts from4/19 -5/22 , going0-2 with a 6.04 ERA(44.2IP, 30ER) overthe span... washis longest stretchwithout a victoryin a single seasonsince his last sevenstarts of the 2005season w/ Florida (0-6, 5.87 ERA, 38.1IP,25ER)... made four consecutive star tswithout drawing a decision from 4/19-5/6 , marking hislongest such stretchsince 5/21-6/10/05 (w/Florida)...On 4/25 at Boston,was staked to a 6-0lead before allowing8 ER over 2.0 IP (fourth and fifthinnings)... according to the Elias Sports Bureau, it marked just the second time in 34career starts he did not earn a win whengiven a lead of five or-more runs... the 16-11 Yankees loss marked just the third time in franchise history that the Yankees losta game by at least five runs in a game in which they had once led by at least six runs... had last happened on 6/5/56 vs. Cleveland (led 6-0, lost 15-8)... marked the largest lead blown against Boston since 5/16/68 atFenway Park (led 9-3 in the fourth, lost 11-10)...Surrendered a leadoff home run to Philadelphia's Jimmy Rollins on the first pitch of the game on 5/22 atYankee Stadium, snapping a stretch of 42 consecutive starts without allowing a first-inning home run thatdated back through his first start of the 2008 season...Over an 11-start stretch from 5/27-7/27, was 8-2 with a 2.08 ERA (69.1IP, 16ER) and a .209 opponents average(53-for-253), limiting his opponents to 3ER or less in each outing... held his opponents scoreless three timesand had one additional start in which he did not allow an earned run (7/27 at Tampa Bay: 1R/0ER)... allowedjust one first-inning run over a 15-start stretch from 5/27-8/17...Was suspended six games by Major League Baseball on 6/4 for allegedly "intentionally throwing a pitch in thehead area of Nelson Cruz of the Rangers" during the top of the fifth inning on 6/2... appealed the suspensionand settled his appeal on 6/21 at a reduced penalty of five games... served the suspension from 6/21-26...Compiled a 0.99 ERA (27.1IP, 3ER) and went 3-1 over his four starts from 6/14-7/3, facing the team that draftedhim (Mets-2GS), and the other two teams that he has pitched for in the Majors (Florida and Toronto)... allowedtwo-or-fewer runs with at least 7K in each of those four starts... according to the Elias Sports Bureau, becamejust the fourth Yankee to compile such a stretch in a single season in the last 40 years since Divisional playbegan in 1969 - also Ron Guidry (1978, '81), David Cone (1997) and Mike Mussina (2003)...Started and won the Yankees' 15-0 victory on 6/14 vs. the Mets (7.0IP, 4H, 4BB, 8K)... marked the Yankees'largest shutout since a 15-0 win in Game 1 of a doubleheader on 9/25/77 at Toronto and their largest in ahome game since a 15-0 win on 8/4/53 vs. Detroit...Struck out the side in the third inning in 6/20 loss at Florida on nine pitches (Johnson, Coughlan andBonifacio - all swinging)... according to Elias, became the 40th pitcher all-time to accomplish the feat andjust the third Yankee, joining Al Downing (1967) and Ron Guidry (1984)...Completed the 2009 first half with an 8-4 record (.667),marking his best-ever winning percentage at the All-Starbreak... was just his third winning record prior to thebreak (also 10-8 in 2008 and 8-6 in 2002)...Tossed 7.2 scoreless IP (1H, 6BB, 6K) on 8/7 vs. Bostonwhile recording a no-decision in a 15-inning, 2-0 Yankeesvictory... allowed a single to Jacoby Ellsbury to lead offthe game, then did not allow a hit to his final 27 battersfaced (6BB, and a catcher's interference)... became thefirst Yankee to toss at least 7.2 scoreless IP and allow 1Hor 0H since Mike Mussina threw a CG one-hitter on 9/2/01at Fenway Park...Allowed a career-high 9R (all earned) in a 14-1 loss on8/22 at Boston (5.0IP, 9H, 2BB, 6K, 3HR)...Picked off Ichiro Suzuki twice in 9/18 loss atSeattle... became the first Yankees RHP to record twopickoffs in the same game since Wade Taylor on 8/17/91vs. the White Sox...Won his 100th career game in his final start of the seasonon 10/4 at Tampa Bay, allowing 2R/1ER in 5.0IP (7H, 1BB,3K)...Made his postseason debut, going 1-1 with a 5.27 ERAin five starts... did not draw a decision in first careerpostseason start on 10/9 in Game 2 of the ALDS vs.Minnesota (6.0IP, 3H, 1ER, 5BB, 6K, 2HP)... marked thefewest hits allowed by a Yankee making his first careerpostseason start since Orlando Hernandez (7.0IP, 3H) inALCS Game 4 at Cleveland on 10/10/98... earned the winin his first World Series start on 10/29 in Game 2, limitingthe Phillies to 1ER on 4H in 7.0IP (2BB, 9K)... according tothe Elias Sports Bureau, entered the 2009 playoffs tiedwith Brian Moehler for the fourth-most regular seasonstarts among active pitchers without appearing in thepostseason, behind only Roy Halladay (287), Randy Wolf(275) and Jamey Wright (246). Was 18-10 with a 4.07 ERA in 35 games (34 starts) with 231 strikeouts in 221.1IP for Toronto, recording careerhighs in wins, innings pitched and strikeouts... opponents batted .249 (211-for-849, 19HR); LH .262 (126-for-481,11HR), RH .231 (85-for-368, 8HR)... held the opposition to a .203 average (57-for-281) their first time throughthe order, and then allowed a .271 average (154-for-568) thereafter...Led the AL in strikeouts and strikeouts per 9.0IP (9.39), tied for tops in the AL in starts, ranked third in inningspitched and tied for fourth in wins... recorded a career-high six games with 10-or-more strikeouts... becameonly the third Blue Jays hurler to record at least 200 strikeouts in a season, joining Roy Halladay (2003, '06)and Roger Clemens (1997-98)... also became only the second Blue Jay to lead the league in strikeouts, joiningClemens (1997-98)...Combined with Roy Halladay for a total of 38 victories, representing the most by any duo in Blue Jays history,surpassing the 37 by Jack Morris (21) and Juan Guzman (16) in 1992...Combined to go 5-3 with a 3.09 ERA (75.2IP, 31R, 26ER) in 11 starts against 2008 AL playoff teams... also wonhis only start against the World Series-champion Phillies on 5/17 at Citizens Bank Park, limiting Philadelphiato 2ER in 6.1IP...Opened the season 6-7 with a 5.42 ERA in his first 16 games (15 starts) through 6/19, as the Blue Jays went7-9... over his final 19 starts, went 12-3 with a 3.12 ERA and 141 strikeouts as the Blue Jays went 13-6... woneight of his last nine decisions...Made his lone relief appearance of the season-and fourth of his career-on 4/16 vs. Texas, allowing 2ER in1.0IP and recording the loss in the 14-inning contest...Did not allow an earned run over 17.0 consecutive innings from 9/9-19 facing Chicago-AL and Boston(twice)... was charged with just 4ER total over his final four starts, going 2-0 with a 1.29 ERA. Won 10+ games (10-8) for the 5th time inhis career and 2nd consecutive season with the BlueJays...Spent time on the disabled list twice with a shoulderstrain (June 13-28 and June 29-Aug. 12)...Made one startbetween stints on the disabled list...Upon returning fromthe disabled list Aug 12, posted a 5-2 record with a 3.01ERA in 10 starts...Held opponents to a .202 average overthat span...WHERE HE RANKED: Limited batters to a .214average which ranked 2nd in the AL among starting pitchers(Bedard .212)...Was 4th with 9.56 strikeouts per nine inningspitched...Team record was 12-13 in hisstarts...Recorded 17 quality starts and eight consecutiveupon his return from the DL Aug. 12...NEW HIGH: Set a careerhigh with five 10+ strikeout games to mark 16 in his career...At home was 6-3 with a 3.19 ERA in 12 starts...Posteda 7-1 record with a 3.01 ERA vs. all AL East opponents,holding them to a .206 average...Finished 1st on the clubwith 170 strikeouts, T-2nd with two complete games andranked 3rd on the team with 165.2 IP... Held LH hitters to a.200 batting average...Recorded a season high 13 strikeoutsand 130 pitches June 7 vs. TB...May 11 vs. TB brokeoff the teams nine-game losing streak...Won his first of theseason in the Jays home opener vs. KC on Apr. 9...June 7vs. TB set a season high with 13 strikeouts & 130pitches...The 13 strikeouts is his highest total since Apr. 22,2005 vs. CIN (13-K). Had two separate stints on the disabled list in 2006with scar tissue break-up caused from previous elbow surgery...Began the season on the DL, and was activated onApr. 15... Made two starts before being placed back on theDL Apr. 22... Was activated June 22 for the balance of theseason... Earned his first victory as a Blue Jay June 27 vs.WAS, Complete Game Shutout (9th career)... 9.0IP, 6H, 7K,first shutout since Aug 9, 2005 vs. ARI... Became just the3rd Toronto pitcher to record a shutout for their 1st Blue Jayvictory (Paul Mirabella - Apr 17, 1980 & Tom Underwood -May 9, 1978) ...July 16 vs. SEA posted his 800th careerstrikeout. Set Marlins career marks for wins (49), losses (50),shutouts (8), complete games (14), strikeouts (753), gamesstarted (131) and innings pitched (847.2)... Matched Club'ssingle-game record with 14 strikeouts on July 6 vs. Milwaukee...Tied the franchise mark he set with 14 strikeouts backon August 29, 2004, vs. Colorado... Tied with Pedro Martinez(NYM) and Roy Oswalt (HOU) for third in NL with fourcomplete games, behind Dontrelle Willis and Chris Carpenterwho each had seven complete games...Tossedback-to-back complete-game victories on April 12 vs. Philadelphiaand April 17 at New York (NL)... Named NL Pitcherof the Week on April 18...Won seven consecutive startsfrom July 19 to August 19, a career high...Went 0-6 with5.87 ERA in final seven starts... Six-game losing streakmarked longest of his career, surpassing previous long offour straight losing decisions...Belted third home run of careeron July 24 at San Francisco, a solo shot off KevinCorreia... Recorded triples with first two hits of season, becomingthe first pitcher to hit two triples in a season sinceMike Hampton hit three with Houston in 1999... Of 10 hits,five were extra-base hits. Made his return from Tommy John Surgery andposted a 7-6 record with a 3.68 ERA in 20 games (19starts)...Went 6-0 with a 2.80 ERA and a .188 BAA in his 11home games and was 1-6 with a 5.09 ERA and a .291 BAAin his nine road games (eight starts)... First pitched on May18 in an extended spring training game against the Cardinals(4.1 IP, 3 H, 0 R, 1 BB, 7 SO). Saw his season end after four starts as he underwentTommy John surgery on his right elbow on April 29... Thesurgery to repair the torn elbow ligament was performed in a90-minute procedure by Dr. James Andrews in Birmingham,Alabama... Began the season on the disabled list (retroactiveto March 21) with synovitis in his right elbow. Was named the most improved Marlin by the SouthFlorida chapter of the Baseball Writers Association of America(BBWAA)... Posted the third-highest season strikeouttotal (203) and the fourth 200-plus strikeout season in franchisehistory... Ranked sixth in the National League andseventh in the Majors with 203 strikeouts...Ranked secondin the NL and fourth in the Majors with a .209 opponent battingaverage... Ranked third in the Majors with a .190 opponentbatting average at home... Led the Majors by tossingfive shutouts... All five of his shutouts came at home... Finishedtied for third in the Majors (with KC's Paul Byrd) withseven complete games, one behind co-leaders Bartolo Colonand Randy Johnson... Was placed on the disabled liston August 19 with a right acute bone bruise... Was activatedfrom the DL on September 14 and made fourappearances after his return. Tossed the third no-hitter in Marlins' history, oneof two in the Majors in 2001... At that time, threw the 203rdno-hitter of baseball's modern era (since 1900), the 98th inNL history and the third in Marlins history in a 3-0 win at SanDiego on May 12... Joined Al Leiter (May 11, 1996 vs. COL)and Kevin Brown (June 10, 1997 at SF) as the only Marlins toaccomplish the feat... Struck out seven and walked nine,equaling the Club record for walks in a game (Al Leiter, May22, 1996 at Cincinnati)... Also hit a batter and threw a wildpitch... Became the first pitcher in the modern era to issuenine walks in a complete game nine-inning no-hitter... Therecord for walks in a no-hitter is 10, by Cincinnati's JimMaloney in a 10-inning no-hitter at Chicago (NL) on August9, 1965... Was second only to Maloney in baserunners allowedin a no-hitter, with Maloney allowing 12 (10 BB, oneerror, one HBP) and Burnett allowing 10 (nine BB, oneHBP)... Was the eighth Marlin to be named NL Player of theWeek and the third Marlins pitcher to be honoured...Tossed the second complete game two-hitter in Club history in a 6-1 win on June 9 at Toronto,... Began the seasonon the 15-day DL with a stress fracture to the fifth metatarsalin his right foot... Diagnosed during an examination by Dr.Robert Mills in Fort Lauderdale on February 22... Wasplaced on the 15-day DL on March 31 retroactive to March23... Had his injury rehab assignment recalled on May 1and made his season debut on May 7 at LA vs. Kevin Brown. Made his season debut in the second game of a doubleheaderagainst Atlanta on July 20... Hit his first careerhomer on August 28 off St. Louis pitcher Rick Ankiel... Suffereda complete rupture of his ulnar collateral ligament inhis right thumb during pitcher's fielding practice on Tuesday,March 14 at Spring Training in Viera... Surgery wasperformed on March 21 by Dr. Brian Fingado at Holy CrossHospital in Fort Lauderdale. Made his Major League debut August 17 at Los Angelesin a spot start for Alex Fernandez and became the firststarting pitcher in Marlins history to earn a win in his debut...Selected to pitch for U.S. team in the inaugural FuturesGame... Tossed one scoreless inning in the game on July11 at Fenway Park. Selected as the Marlins' Organizational Pitcher of theYear after his first season in the Florida farm system... Ledthe organization with a 1.97 ERA and 186 strikeouts andwas tabbed by Baseball America as the top Major Leagueprospect in the Marlins' organization and the number fourprospect in the Midwest League... Led all minor leaguestarters with 14.07 strikeouts per nine innings... His totalranked second highest among all hurlers in the Majors orminors, including starters and relievers... Led all minorleague starters by holding opposing batters to a .179 battingaverage... Finished second in the Midwest League andthird among all minor leaguers with a 1.97 ERA... Namedthe Midwest League Pitcher of the Week for June 22-28, going1-0 in two starts... Named the Marlins' OrganizationalPlayer of the Month for June... Named the Midwest LeaguePitcher of the Week for second time August 30-September7...Missed the first six weeks of the season (April 9-May 16)after undergoing surgery to repair a broken right hand. Played on two teams, the GCL Mets and Pittsfield,with both winning their respective league championships...Went on DL from June 17-July 1 due to a broken left foot. Was undefeated in 12 starts, earning four victories...Held opponents to a .171 batting average and struck out10.55 batters per nine innings, both totals ranked second inthe Appalachian League. November 2, 2015 RHP A.J. Burnett elected free agency. October 8, 2015 Pittsburgh Pirates activated RHP A.J. Burnett. October 7, 2015 Pittsburgh Pirates reassigned RHP A.J. Burnett to the minor leagues. September 10, 2015 Pittsburgh Pirates activated RHP A.J. Burnett from the 15-day disabled list. November 14, 2014 Pittsburgh Pirates signed free agent RHP A.J. Burnett. November 3, 2014 RHP A.J. Burnett elected free agency. February 16, 2014 Philadelphia Phillies signed free agent RHP A.J. Burnett. October 31, 2013 RHP A.J. Burnett elected free agency. October 3, 2013 Pittsburgh Pirates activated RHP A.J. Burnett. October 1, 2013 Pittsburgh Pirates reassigned RHP A.J. Burnett to the minor leagues. July 7, 2013 Pittsburgh Pirates activated RHP A.J. Burnett from the 15-day disabled list. June 13, 2013 Pittsburgh Pirates placed RHP A.J. Burnett on the 15-day disabled list retroactive to June 9, 2013. Right calf strain. April 21, 2012 Pittsburgh Pirates activated RHP A.J. Burnett from the 15-day disabled list. April 16, 2012 Bradenton Marauders sent RHP A.J. Burnett on a rehab assignment to Indianapolis Indians. April 6, 2012 sent RHP A.J. Burnett on a rehab assignment to Bradenton Marauders. April 4, 2012 Pittsburgh Pirates placed RHP A.J. Burnett on the 15-day disabled list retroactive to March 26, 2012. Fractured right orbital bone. February 19, 2012 New York Yankees traded RHP A.J. Burnett to Pittsburgh Pirates for RHP Diego Moreno and OF Exicardo Cayones.